Features: Resists corrosion undercutting of paint. Description: An organic long-term corrosion inhibitor designed for use in most solvent based coatings systems. The hydrophobic nature and polar bonding properties of this product aid in the prevention of corrosion undercutting. It is well suited for use in primers, direct-to-metal one coats, and high gloss applications. 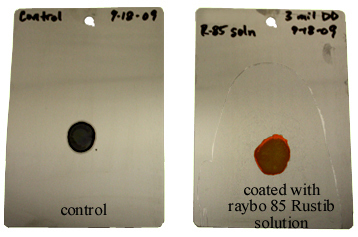 The coating on the Scenic Blue Water Bridge contains raybo 85 Rustib. 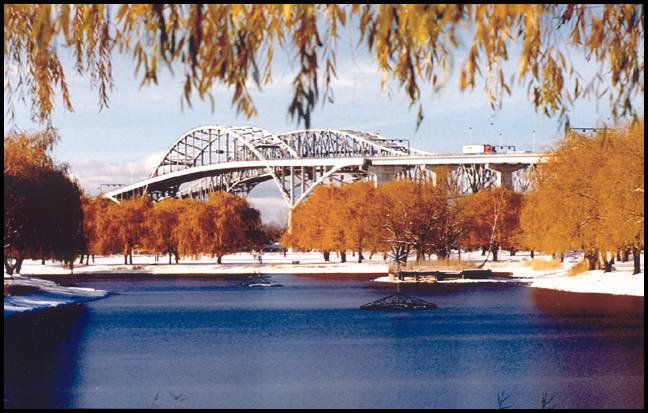 The bridge spans the St. Clair River between Point Edward, Ontario and Port Huron, MI. Because of the polarity of raybo 85 Rustib, it is attracted to the metal surfaces forming a mono-molecular hydrophobic layer. This affinity increases adhesion and resistance to corrosion undercutting. 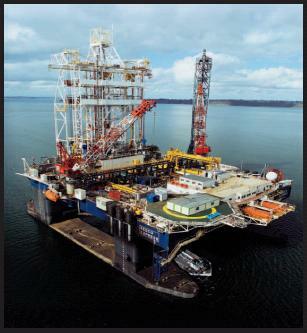 The coating on this oil well platform contains raybo 85 Rustib (photo courtesy of Ameron International). 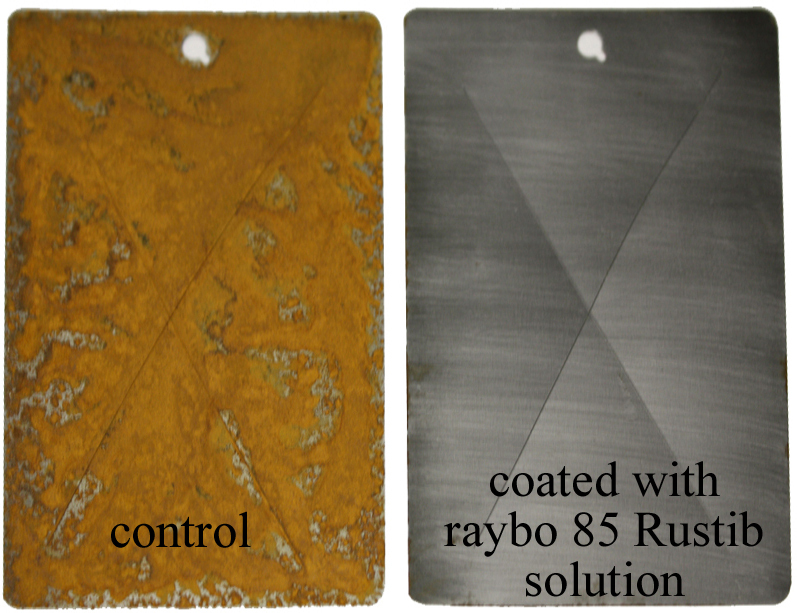 The hydrophobic nature and polar bonding properties of raybo 85 Rustib increase adhesion and help prevent corrosion undercutting. Scribed panels placed in a sealed jar with water for 24 hours. The water was not able to react with the steel on the test panel, due to the hydrophobic properties of raybo 85 Rustib, and did not corrode like the control panel. Panels with drops of water containing orange dye. The dye was not able to react with the steel of the test panel, due to the hydrophobic properties of raybo 85 Rustib, and dried orange. The dye reacted with the steel of the control panel and turned dark brown. 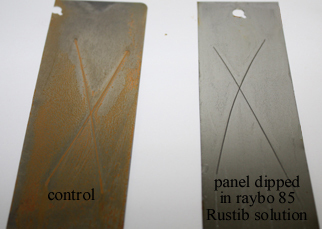 Abraded steel panel with the right side coated with a thin layer of raybo 85 Rustib solution; the panel was placed in a corrosive environment for 1 hour. The hydrophobic nature and polar bonding properties of raybo 85 Rustib prevented the right side from corroding. Abraded and scribed steel panels placed in a corrosive environment for 1 hour. The panel on the right was coated with a thin layer of raybo 85 Rustib solution. 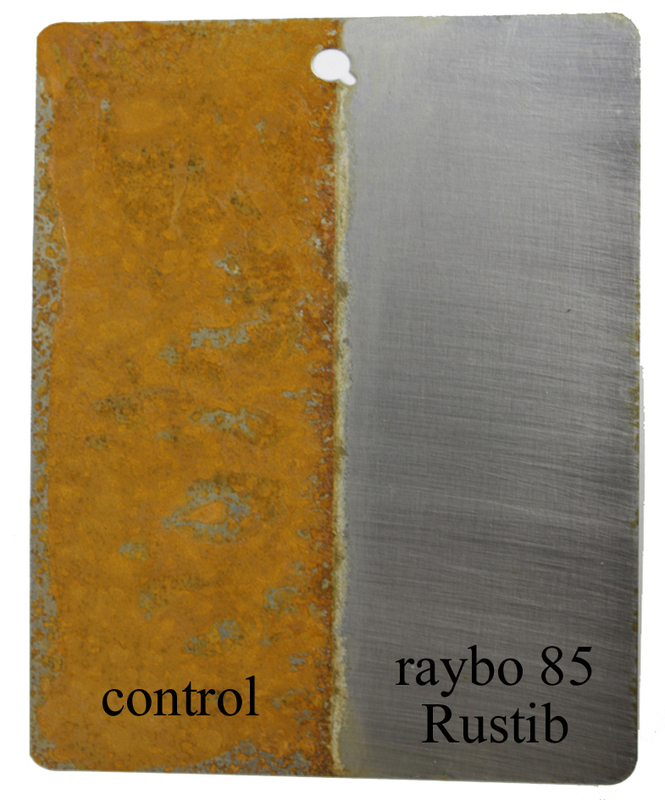 The properties of raybo 85 Rustib prevented the steel panel from corroding.